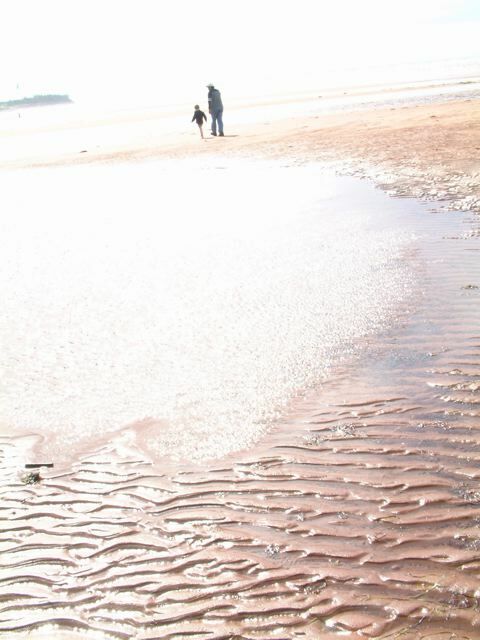 On a warm and windy fall day, Grandpa takes Spud for a little walk on the red beaches of PEI. Gorgeous and touching photo... and I am such an Anne of Green Gables fan... can't think of PEI without thinking of Anne-Girl. Beautiful photo! I love the texture of the sand! Do you ever wonder what they are talking about? We went to PEI the year before the Confederation Bridge was built...you still had to take the ferry to get to the island. I loved the "Anne" books, and going to PEI was a dream of mine. While Charlottetown and the "Anne crap", as Tim so inelegantly put it, was quite touristy...we found the spirit of Anne's island in the smaller towns and at the more isolated tips on either end of the island. It's one of those places I'd love to return, but I wonder how much the bridge has affected the island's ambiance...for good or ill. This photo reminds me of some of those idyllic days. I love Anne so much that I'm rather afraid to visit PEI and be disappointed (especially if it's touristy). But your photo tempts me. That light on the sand looks just like I had imagined it would. You guys are all so cute! I feel a little ashamed that we didn't take in any "Anne" while we were there. We actually avoided completely, intentionally ... the touristy side. I wonder now, if we should have dabbled in it a little, but nonetheless, I think it's pretty easy to find the "real" PEI. The bridge seems to have meant that more islanders work in neighbouring provinces. But perhaps it's good because they can still live at home; they don't actually have to move to work now. My favourite memories of the island are the little cottage we called home for a week, and the beaches, which vary in style depending on where you are on the island. It's a beautiful place.